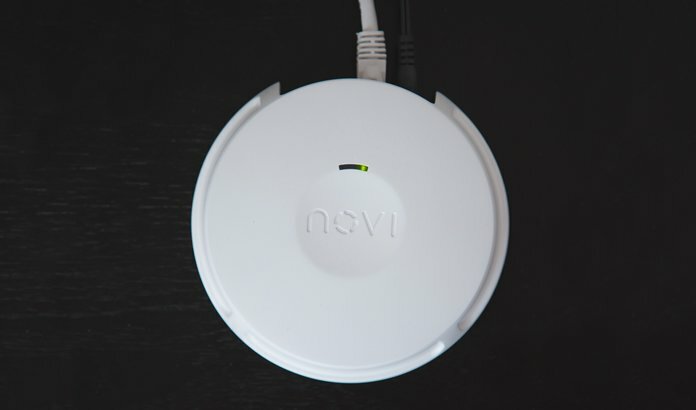 The Novi Security 4-in-1 Home Security system offers Motion and Smoke detection in a easy to use low bandwidth, minimalist fashion to help you keep tabs on what’s going on in your home or rental property when you’re not there. 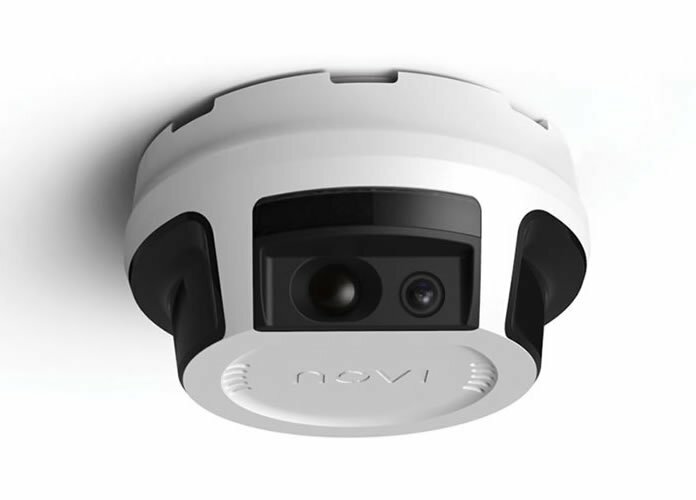 The Novi Security system features a combination Security camera, Smoke Detector, Motion Sensor and a 90dB Siren. The main unit is the Sensor which resembles a familiar smoke detector shape and a Base/Relay Station. The Novi Sensor is wireless and is powered by 4 ordinary AA batteries and gives you up to a year of power (based on 3 pictures a day). A battery level indicator is located within the App and it will also alert you when the batteries are running low. The Relay Station however does require tethering and comes with an AC adapter and Ethernet port for internet connectivity. You can also purchase up to 5 additional sensors; Each Relay station is able to connect up to 6 total Sensor units, You can add additional arrays as well. The unit is easy to setup and we didn’t run into any issues doing it, however connectivity and responsiveness could be a bit faster but this will also depend on the App and your internet speeds. The Relay Station measures 5″ D x 1.45″ H and weighs just under 1lb while the Sensor measures 4.75″ D x 2.20″ H and weighs 1.3 lbs. As with any monitoring system, you lose power your out of luck. While the Sensor will draw power from the batteries when your electricity goes out and continue to operate, your Relay Station requires power and internet so it will not relay those images or alerts to you. You’ll have to either have your own battery backup supply or sign up for Novi’s Premium Service. Novi Security’s Premium service offers Cloud based storage and Professional monitoring as an add-on feature. It also offers something very useful a 3G cellular failover service. Lose Internet service and the unit can continue to provide you with alerts and monitoring. Premium service can add some great functionality but also tacks on ongoing monetary fees. The good thing is if you really want to try out the Premium services, they go month to month so you’re not locked into anything if you don’t like it. The Relay station connects to a wall outlet and near your router for Ethernet cable but what’s nice is the Sensor can be placed anywhere and remains wireless. It can be placed up to 300 feet away from the Relay but it’s important to note that each unit is not a repeater so if you have multiple Sensors, they should all remain within 300 feet of the Relay. As with any WiFi based product, multiple walls and electrical interference can affect the signal, you’re mileage may vary. 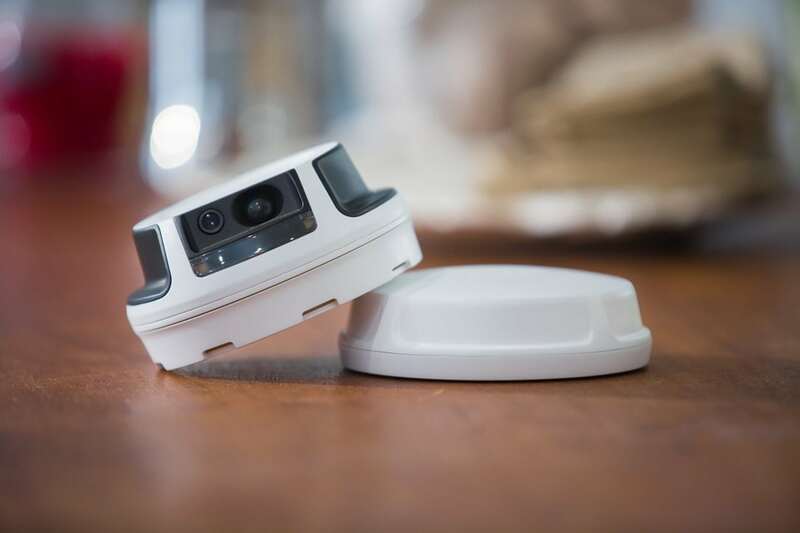 The Sensor communicates with the Relay station and sends you 3 pictures from it’s 720 HD 170 degree wide angle camera based on movement or smoke detection. The motion detector is able to sense movement from 3-25 feet away. The 720HD camera takes 720 HD images at 1.1MP which can be slightly disappointing in clarity depending. The motion detector is IR equipped however will trigger the LED flash to get a clearer picture. For fires that might be great but for monitoring intruders, not completely sure that works for me as the flash would surely alert any would-be criminals invading your property. Perhaps the flash will act as a deterrent, you’ll have to determine what is best for you. 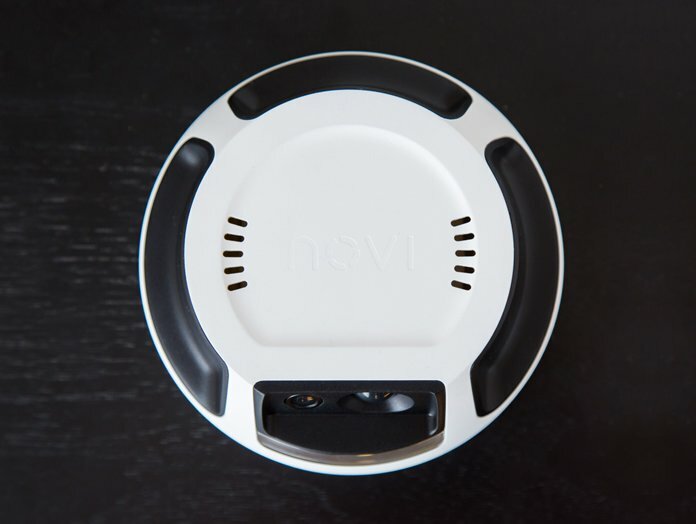 It’s important to note that the Novi smoke detector is Photo electric and also will not detect Carbon Monoxide. Meaning it should not be your only smoke detector. There are two types of smoke detector sensors; Photoelectric & Ionization Sensors or dual. Photo Electric smoke detectors use a light beam, similar concept to your garage door trip sensor. When the beam of light is obscured by smoke, it triggers the alarm. Ionization Sensor smoke detectors use a small amount of chemical element that is used to conduct an electrical current, when smoke hits that current the alarm triggers. Ionization sensors can be prone to false alarms but are able to detect a quickly building fire faster. Photoelectric smoke detectors are ideal for detecting low level smoldering fires and are more sensitive to a fire before it actually bursts into full flames. Ideally it’s best to have both or dual sensor. Chances are you already have smoke and Carbon Monoxide detectors at your location. You’ll be required to use the app, without it the Novi is useless. Using the App to set up your 4-in-1 is easy and informative. It is required to set up and use the device but it will walk you through the entire physical setup as well as configuring all the necessary settings. 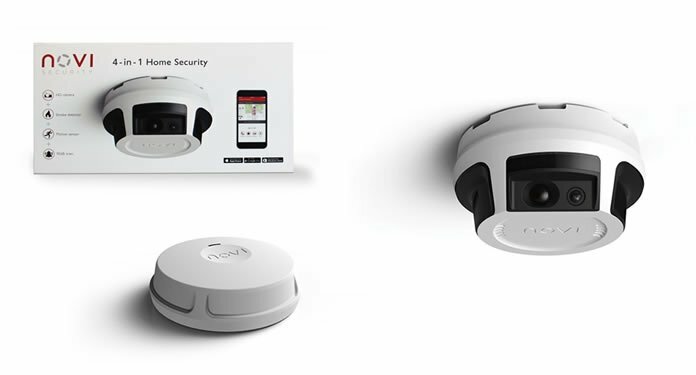 The App extends the functionality of the Novi 4-in-1 and allows you to see a history of your photos, assign emergency contacts that should be alerted in case you’re not available and set your location so Novi Home Security device can contact the local police dept where your 4-in-1 resides. The App is iPhone / iOS and Android compatible. You are also able to arm and disarm the unit as well as manually set off or dismiss the 90dB alarm. You’re able to completely disable this alarm should you choose to. 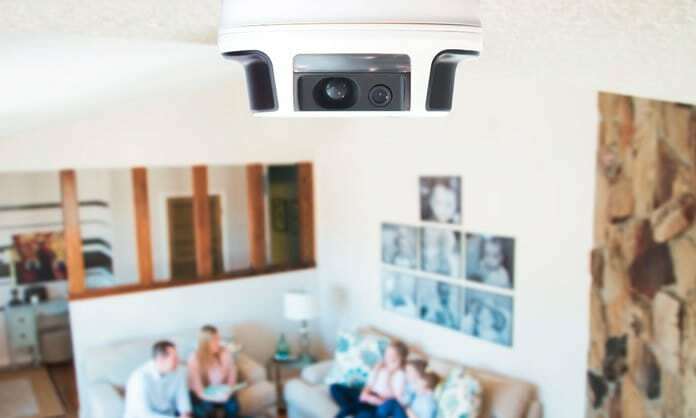 The Novi Security 4-in-1 Home Security System offers a simple to setup & portable monitoring solution that integrates a photo notification via a 720 HD camera, smoke detection, 90dB alarm and battery power into one. These convenient features make it easy and useful for redundant monitoring or added surveillance in rental properties. 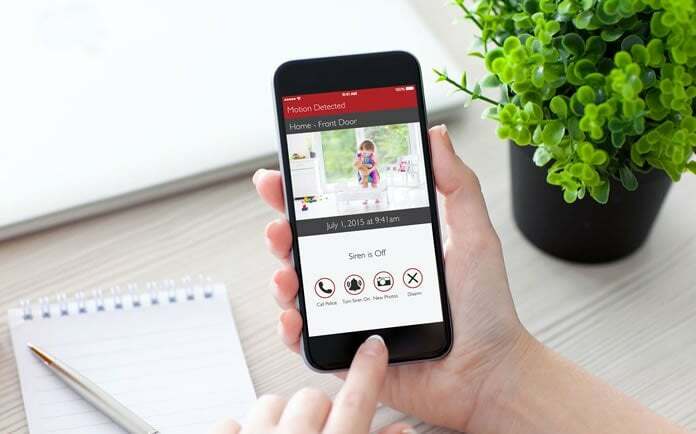 With no mandatory contracts or monthly fees to operate, the Novi Home Security system is a simple way to monitor an area. The setup can be slightly pricey at $299 and $179 for additional sensors but offers a unique monitoring smoke and motion detection in one device that you can set up temporarily or more permanently depending on your desired application.